The Dark Dreamweaver. 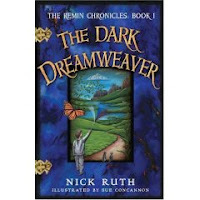 The Remin Chronicles, Book I. Nick Ruth, illustrator Sue Concannon. Copy supplied by publisher, Imaginator Press. David, 11, is having nightmares. But it turns out they are not just bad dreams. There is a place called Remin: "When you dream, the threads of that dream travel through Remin where the imaginary aspects of the dream are given the illusion of reality." David's own nightmares (as well as an increase in bad dreams worldwide) are because something is rotten in Remin. It's up to David to find out and fix it. David is a typical, imaginative, eleven year old. When the caterpillar he's brought home turns out to be a wizard from Remin in disguise, his own years of reading fantasy leave him not only open to the possibility, but excited: "I've always read about other worlds: worlds behind mirrors, worlds where scarecrows are kings, worlds with schools of magic." David takes the plunge and goes into Remin to help the caterpillar/wizard, Houdin. Once there, of course, it's not simple: there are adventures, challenges, skills to learn, puzzles to work out, and, in true fantasy fashion, a group of newly met friends to help. There is humor; not only in the names of things and wordplay (Remin, REM sleep; Houdin/Houdini, Vulcanius mindmeldium) but also in David's own observations: " The spell had worked! He was in Remin! Well, at least, he was somewhere else." I also liked that this is a chapter fantasy book that works for younger readers. There are maps and illustrations; and at just under 250 pages, is one of the shorter works of fantasy out there. Don't be scared by the "Book I" on the cover; David's adventures, and the mystery of Remin, get resolved in this book. Thank you for taking the time to read and review The Dark Dreamweaver. I don't know how I missed including Jen's review, but I'll rectify that. Thanks for pointing out my oversight!